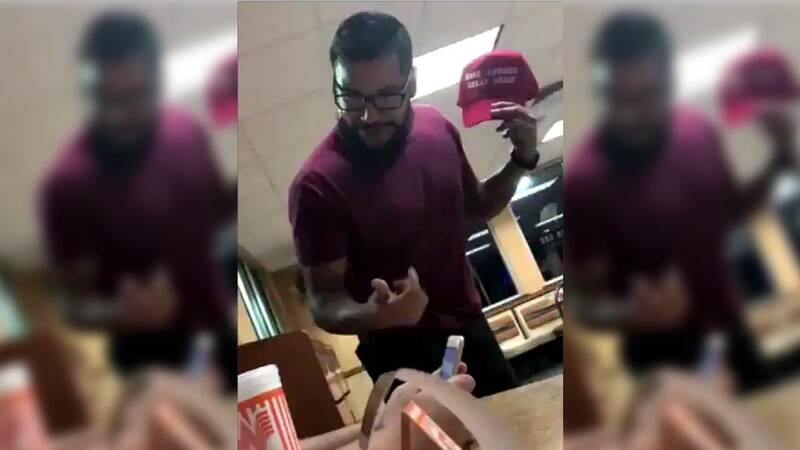 SAN ANTONIO - Video of a teenage Trump supporter having his "Make America Great Again" hat ripped from his head and a cup of soda thrown in his face while at a Northeast Side Whataburger has made its rounds on social media. The video has sparked various rumors, from an anonymous witness alleging the victim and his friends made racist comments prior to the attack, to people publishing what some believe to be the suspect's address and phone number online. Kino Jimenez was arrested Thursday evening and charged with theft of person. Have any questions related to this incident that you want fact checked? Send an email to mmedina@ksat.com. Does Jimenez have a criminal history? A search of Bexar County court records shows that Kino Jimenez was charged with driving while intoxicated in 2016 and pleaded no contest. He was charged with burglary of a vehicle in 2012, but that charge was dismissed in February 2013, according to online court records. Jimenez was also charged with possession of marijuana in 2008 and the charge was dismissed through deferred adjudication. Has Jimenez spoken out on the incident? KSAT 12's Katrina Webber caught up with Kino Jimenez outside the Bexar County magistrate's office early Friday morning and Jimenez said, off camera, that what happened was a lapse in judgment that was out of character for him. He told KSAT that seeing the hat had the same effect on him that a Ku Klux Klan hood would have had. He also said that, since the video went viral, he and his family have been receiving threats. Does Jimenez live at the address being shared on social media? No. Jimenez's brother called police and said that Kino Jimenez no longer lived at his house and that he was concerned about retaliation. One of Jimenez's brothers turned Jimenez in to police, according to an affidavit. "People have been posting his old address and doxing it, but it's really my address. (Jimenez) doesn't live here anymore," one of Jimenez's brothers told KSAT. "(Jimenez) hasn't lived here for the last five years." Other unrelated people also live at the house, the brother told KSAT. Jimenez, however, does not live there. Has the President commented on the incident? While President Donald Trump has not directly commented on the incident, his oldest son, Donald Trump Jr., said he wanted to give the victim a hat signed by the president. "Imagine someone did this to an Obama supporter?!?!" Trump's son tweeted Thursday. Whataburger's corporate communications department said none of its employees were involved or witnessed the attack.